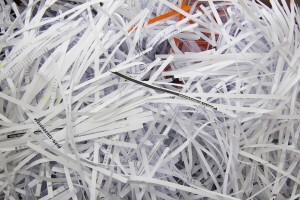 Get up to five boxes or bags of documents shredded for free during Shred Day at Mentor Public Library. Have sensitive documents like tax forms or medical records that you want to get rid of? Bring them to the library. We’re partnering with Xpress Shredding for our ninth annual Shred Day in which people can have their documents shredded for free. Shred Day will be held from 9 a.m. to 1 p.m. Saturday, April 13, in our auxiliary parking lot on the corner of Mentor Avenue and Sharonlee Drive. The free service is available to Mentor residents and library patrons. People can drop off as many five document-storage boxes or bags of paper. All documents will be loaded into locked bins on a secure truck, which will be attended at all times by Xpress Shredding staff. They can even help patrons remove their boxes or bags from their cars for them. Then the truck will take the boxes and bags to Xpress’s secure facility where the documents will be shredded and the shredded paper recycled. Shred Day will be held rain or shine. By the way, if you’re looking for anything else to do that Saturday, visit the second annual Northcoast Writers’ Showcase from 11 a.m. to 5 p.m. at Lakeland Community College in Kirtland. The free event brings together dozens of local authors and publishers, along with Behold the Dreamers writer Imbolo Mbue, for a day or writing workshops and a celebration of the written word. Participating authors include David Giffels, Rachele Alpine, Mindy McGinnis, Claire McMillan, Tom Batiuk, James Renner and many more! This entry was posted in Uncategorized and tagged Mentor Public Library, Shred Day, XPress Shredding. Bookmark the permalink.